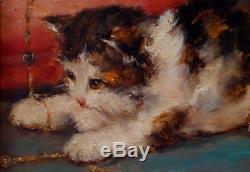 On sale every Friday evening at 8 pm old quality paintings: add to my favorite sellers. Subscribe and be notified each week of my new sales! Oil on wood, 24cm x 20cm (except frame, 37cm x 33cm in all), signed and dated lower left ch. He was the pupil of his father, Charles the First, then Joseph Stevens at the Royal Academy of Brussels. He debuted at the Brussels Salon of 1881 where he exhibited regularly as well as in cork, antwerp, gand, the netherlands, germany, spain and france. He painted several paintings for the queen marie-henriette of belgium. He is totally specialized in genre scenes with animals and was especially recognized for his paintings with cats for protagonists. Works at the museum of Antwerp. 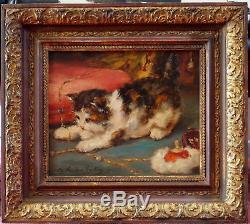 Artist listed at the benevit (with signature copy), arto and piron, artprice, artnet, mayer, akoun .... 265 results from 1600 to 38000 euro for paintings of cats! Sold with a certificate of authenticity. Beautiful Flemish school painting of the early 20th century, executed in 1911, representing a kitten playing with jewels. 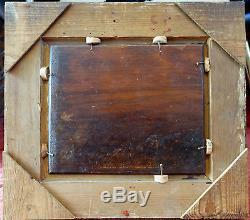 This wood panel is in excellent condition 100% original. The paint, never cleaned and not dirty, is in perfect condition 100% original, neither repainted nor repair of any kind. Strictly nothing comes out of the lamp u. It is in its beautiful original frame 1911 in good condition (visible wear). This table is in excellent condition 100% original! Recently out of the house! Never seen on the market! Sold with a certificate of authenticity. Hand delivery at the welcome store !! Payments accepted: pay pal, bank transfer, check. Immediate shipment from France or Belgium upon receipt of payment! 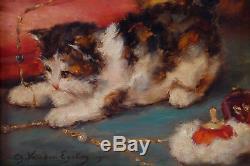 View other seller's items Add to my favorite sellers. Oil on wood, 24cm x 20cm (out of frame, 37cm x 33cm), signed and dated down on the left ch. Acharles van den eycken ii, 1. He was a pupil of his father at the royal academy of brussels. He started at the brussels salon of 1881 where he exhibited regularly and in liege, antwerp, ghent, the netherlands, germany, spain and france. He painted several paintings for queen marie-henriette of belgium. He specialized completely in genre scenes with animals and was especially recognized for his paintings with cats for protagonists. Works in museum of antwerp. Artist listed in benevolence (with signature example), art and piron, big international value on artprice, artnet, mayor, akoun ... 265 results from 1500 to 38000 euro for cats! 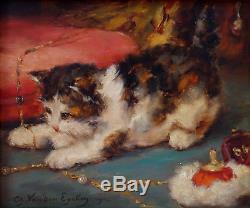 Beautiful flemish school painting early 20th century, held in 1911, representing a kitten playing with jewels. 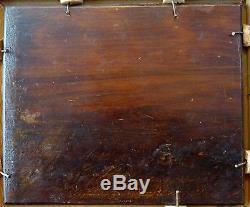 This wood panel is in very good condition 100% from origin. The painting, never cleaned and not dirty, is in perfect condition 100% original, no repaint or repairing. Strictly nothing appears under the u. In its splendid 1911 frame from original ingood condition (visible little wears). This picture is in excellent condition 100% original! Just come out of a house, first time on the market! Photos shooted with the sun light! If you want high-definition pictures, just ask for it! All my photos are realistic since taken in the sun! No flash, so no artifice! Do not hesitate to ask me high-definition photos! My paintings are accompanied by an invoice worth of certificate of authenticity written by me. 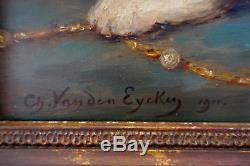 Entirely handwritten, it accurately describes the painting, certifies the author, period and authenticity. This writing has a European legal value of 10 years. I accept my responsibility for everything I sell, my 100% positive estimates are there to testify! 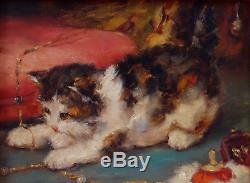 The item "charles van den eycken, 1911, benevit, huge size! The kitten and jewels" is on sale since Thursday, September 13, 2018. 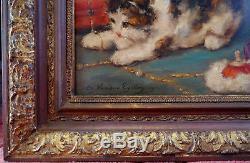 It is in the category "art, antiques \ art of the nineteenth and before \ paintings, enamels ". The seller is "web-anti-broadcast" and is located in / mouscron. This item can be delivered anywhere in the world.